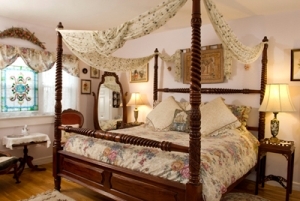 The Victorian Room is a very spacious corner room featuring a four poster king-size bed, romantic fireplace (seasonal), new full private bathroom, flat screen cable, DVD, free wireless internet (Wi-Fi) and air-conditioning (seasonal). A full 3- course gourmet breakfast is served daily for your enjoyment in our beautifully decorated dining room. 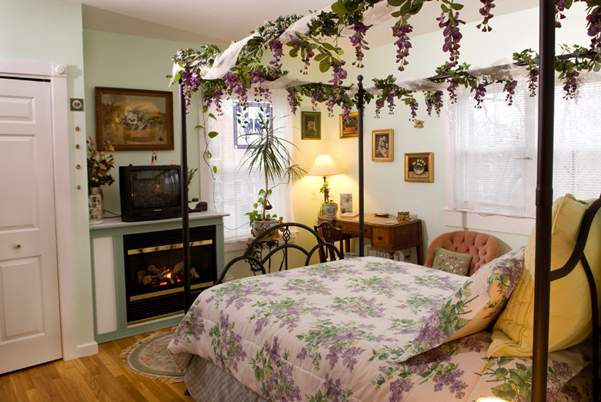 The Lilac Room features a queen-size canopy bed, fireplace, romantic fireplace (seasonal), new full private bathroom, flat screen cable, DVD, free wireless internet (Wi-Fi) and air-conditioning (seasonal). Oreo, Scottie and Gizmo are our 3 resident house cats . 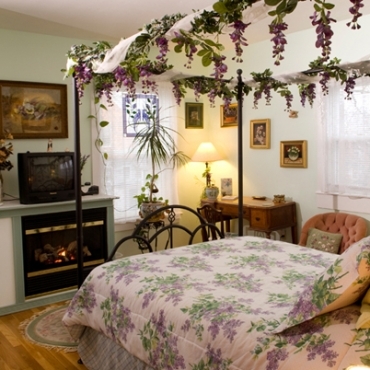 For the comfort of our guests smoking is not allowed anywhere on the premises. 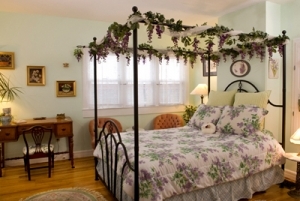 Call Us About Our Special Midweek Rates from November thru April.